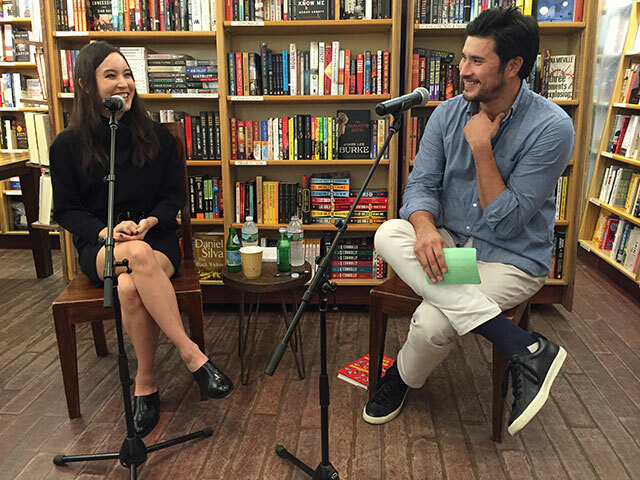 Alexandra Kleeman, author of the novel You Too Can Have a Body Like Mine, launched her first collection of short stories, Intimations, at McNally Jackson Books in Manhattan. She was joined in discussion of the collection by her husband, Alex Gilvarry, author of the novel From the Memoirs of a Non-Enemy Combatant. Gilvarry begins by saying the couple is often asked what it is like to be married to another writer, and also another person named Alex. Kleeman says that she enjoys being married to a writer because with a marriage between two writers, both of them are always allowed to talk about books all of the time. When they disagree, they are able to channel that energy into writing fiction often diffusing arguments. As a couple, they don’t write together. Their process is different. Gilvarry prefers writing at night, and Kleeman with interrupt her process to watch trashy television. However, they have the benefit of intimacy Kleeman explains, more so than even a workshop could provide. Sometimes what she needs as a writer is more sleep or to eat some food, and Gilvarry will remind her to do it. Small details from their lives always end up in stories though, Gilvarry says, like in the story Kleeman read, “Jellyfish.” In the story, a couple is eating meat at a buffet, and Karen is disgusted by her husband piling of meat onto his plate. The character Karen also insists her husband only wants to eat because it’s lunchtime, not because of hunger, another detail Kleeman says she has taken from her husband. “Lunch is a faint echo of dinner,” Kleeman says to clarify her position on the controversy of mealtimes. The stories in the collection are all clustered in time, Kleeman says to describe the collection. “I’m hoping my obsessions will change.” Every story has teeth in it, she notes. Writing a novel requires a strong ability to focus. Writing the stories was a way for Kleeman to release stress built up from the novel. She would start a story whenever she felt like she hadn’t been writing something new. Many of the stories don’t have named characters. Kleeman says she originally came to fiction through poetry and essays where there are rarely named characters. Fiction made her feel like a god, but naming a character felt too personal. Gilvarry says many of Kleeman’s stories defy the basic things he tells his writing students about stories. One of those elements is dream sequences which he often dislikes from students because dreams rarely have consequences. There is nothing more disappointing than finding out something was a dream, Kleeman says. However, with dreams, you lack control of the situation but must move forward. When it comes to writing, Kleeman says she is very intentionally crafting short stories or writing a novel. “I’m not the kind of person who ever writes a novel by accident,” she explains. “I try to trick myself into doing things.” If she is bored, she’ll come up with new ideas because, she says, her brain wants to entertain itself.